The independent Parthian kingdom had had to re-acknowledge Seleucid sovereignty, at least in name, in 209, but Antiochus had too many fires to deal with and could not stay to consolidate his rule in the east. A tribe of “hill people”, the Parthians had traditionally supplied a contingent of horse archers to Persian armies. These proverbial country bumpkins unexpectedly came to power in 247. The Seleucid governor of Parthia, Androgoras, successfully broke free and established his own kingdom around 250, but did not long enjoy his new realm. He in turn was faced by a revolt of the Parni people under their newly elected leader Arsaces (possibly a Bactrian general). Androgoras was killed in battle against the Parni, who then established what history knows as the Parthian kingdom in 246 under the Arsacid dynasty. As there are few surviving Parthian records, early Parthian history can be confusing. As well, each new king ruled under the royal name of Arsaces, and thus it is not always clear when one reign ended and the next began, or if we are dealing with a father and son, or uncle and nephew. In any case, Parthia rose to major power status under the reign of Mithridates (Arsaces V), who ruled from 167 to 132. During his rule the Parthians took Herat in Bactria (in 167), Babylonia (in 144), Media (in 141) and Persia (in 139). These victories gave Parthia control over the silk route to China, and control of this trade became the foundation of Parthia's wealth and power. With these victories, the old boundaries of the empire of the Achaemenids were largely restored. The Parthian kings were even more relaxed in their toleration of foreign religions and cultures. Although Zoroastrianism remained most important, an off-shoot cult of Mithras developed. Mithras was a legendary bull-slayer and associated with light and the sun. Mithras, in fact, may only be a Roman version of Ahura Mazda. The cult spread through Asia Minor, and by the early 1st century AD, had become a popular cult among Roman soldiers. By the end of the 4th century, when the worship of Mithras was in decline, the legions had spread the cult throughout the empire. The Parthian empire, while maintaining the provincial structure, was feudal in form, and the power of the king was often challenged by powerful nobles. The army remained based on a core of heavy cavalry supplied by the nobles, supported by light mounted archers. Infantry was based on poorly trained and equipped feudal levies. 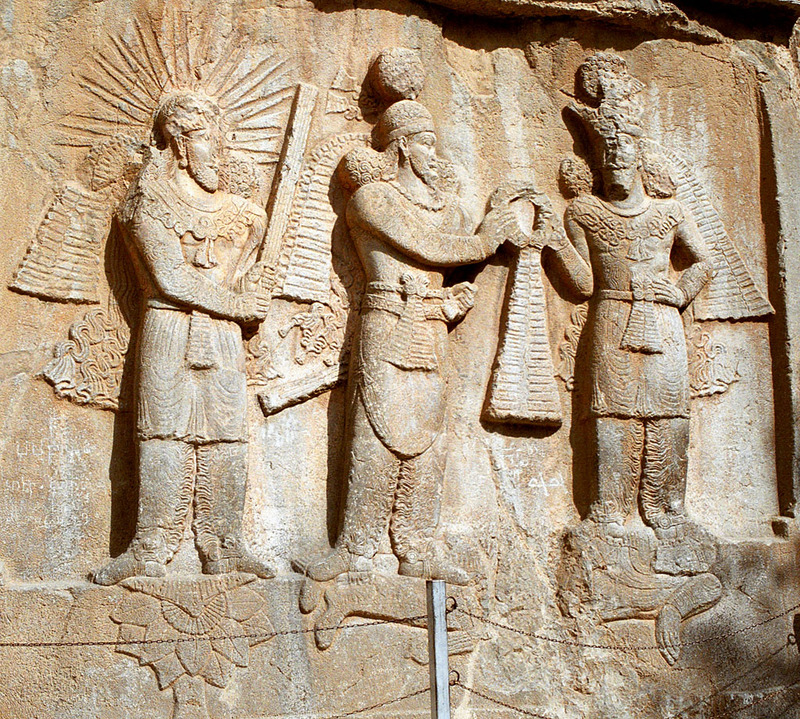 Ardashir II is invested as King of Kings, while Mithras looks on in approval. We are most familiar with Parthia’s long rivalry with Rome over the old Persian provinces in Armenia, Asia Minor, Syria and Palestine. With the defeat of Carthage, Parthia remained as the only major power of note that the Roman republic, and later empire, had to deal with. Less familiar are Parthia’s relations with the Chinese empire to the east and a number of the powerful Indian kingdoms to the south-east. Indeed, it was general Parthian policy to prevent direct contact between the Romans and the East, to protect lucrative sources of trade. Both Rome and Parthia also had to deal with various “barbarian” nations along their northern frontiers. A Parthian army handed Rome one of its most severe defeats in 53 BC at Carrhae, with the loss of seven legions and the general Crassus. His death led directly to the civil war between Caesar and Pompey. However, the decentralized nature of the Parthian monarchy never seemed able to exploit Roman weakness. Armenia, Mesopotamia and Syria remained disputed territories, but neither empire could seem to gain a decisive advantage over the other. There were 49 kings of Parthia (50 if you count Tiridates, the King of Armenia), a remarkably long-lived state considering the potentially inherent weakness of its decentralized monarchy. However, it was eventually an internal rival, not a Roman or Chinese army that overthrew the Arsacids. The Sassanid family led a successful revolt of the Persians, re-establishing a centralized monarchy. The history of the Sassanians is a mix of history and legend. In the late 2nd century, Papak was the vassal king of the Persians. He married his daughter to a nobleman named Sasan, reputedly a descendant of the Achaemenids. A son, Ardashir, became a successful general for Papak, and after his grandfather’s death around 211, he became ruler of what was a semi-independent kingdom. This new Persian empire soon appeared to be more aggressive and nationalistic than any of its predecessors. The “live and let live,” easy-going attitudes of the both the Achaemenids and Arsacids was gone. Zoroastrianism was made official state religion, and other beliefs persecuted. The Prophet Mani (217-77), had preached a universal philosophy which included elements of Zoroastrianism, Buddhism, Christianity and Hinduism. He was supported by the first Shah Shapur I, but after his death, Mani was executed and the Manichaean creed was violently suppressed. Ardashir had, towards the end of his reign, renewed the war against the Roman Empire. Shapur I conquered the Mesopotamian fortresses Nisibis and Carrhae and advanced into Syria. Timesitheus, father-in-law of the young emperor, Gordian III, drove him back and defeated him at the Battle of Resaena in 243, regaining Nisibis and Carrhae. Timesitheus died shortly afterward, and Philip the Arab (244–249) revolted against and murdered Gordian III, after his defeat at the Battle of Misiche. Philip then concluded a peace with the Persians in 244. Attacks by Germanic invaders then distracted the Romans, and Shapur I resumed the war after 251. Tombs of the Sassanids today. Naqsh-e Rustam, Iran. One of the greatest coups of the empire occurred in 260. Shapur conquered Armenia, and sacked Antioch. Rome counter-attacked, and by 257, Emperor Valerian had recovered Syria. In 259, plague devastated the Roman army while concentrating at Edessa, which was then besieged by the Persians. In 260, Valerian arranged a meeting with Shapur to negotiate a peace settlement but was betrayed, captured, and held prisoner for the remainder of his life. The renewed advance into Asia Minor was stopped by Balista, the local Roman commander, while Palmyra revolted in the rear of the Persians, and took all the territory recently captured by Shapur. The Persians even abandoned Armenia. A legend grew that Shapur publicly shamed Valerian by using the Roman Emperor as a footstool when mounting his horse. However, based on other sources and numerous rock carvings, the truth is Valerian and some of his army lived in relatively good conditions in the city of Bishapur. Shapur, indeed, enrolled the assistance of Roman engineers in many of his development and construction plans. After Shapur’s death in 272, he was succeeded by a son Hormizd. He had participated in the Roman wars, but he ruled for little more than a year and died in 273. He in turn was followed by his brother Bahram (the persecutor of Mani), and upon his death in 276, was succeeded by his son, Bahram II. Sporadic warfare continued with Rome during their reigns, but Bahram II had a relatively long reign of 17 years. While the shah was on campaign in Afghanistan, in 282, the Roman emperor Carus invaded from the west, and advanced as far as the capital of Ctesiphon. The Romans retreated upon the sudden and unexplained death of Carus. Emperor Diocletian resumed the war in 286, allied with the Armenian ruler Tiridates. The Armenian monarch defeated two Persian armies in the field. Tiridates successfully invaded Persia itself. Bahram II, a broken man, died in 293. His son Bahram III was named Shah, but just four months into his reign, a wide scale revolt by the Persian nobility broke out in favour of Narseh (or Narses), last surviving son of Shapur and grand-uncle to Bahram III. Bahram’s fate is unrecorded, but it is assumed he was killed during the revolt. Narseh began seven years of war against Rome with a lightning invasion of Armenia. Tiridates fled and Sassanid pride was restored – albeit briefly. The Romans came back in 297. Two indecisive battles were fought, but the Roman general Galerius, son-in-law of Diocletian, was finally routed at a third. The following year, Galerius, after being publicly repudiated by Diocletian, attacked again with a new army supported by Tiridates. Narseh was surprised in his camp at Satala, his army utterly defeated, his wife and children captured and his war treasury looted. He was forced to sign the humiliating treaty of Nisibis which saw Tiridates restored to Armenia, and other territorial losses. Narseh abdicated the throne in 301 in favour of his son Hormizd II who ruled from 302 to 309. Narseh is assumed to have died shortly after 302, and little is known of Hormizd’s reign. Revolt again broke out after his death. He was succeeded by a son Ardur-Narseh, but he was murdered by the nobles after a short reign, his brother was blinded and a third brother, another Hormizd, was imprisoned. This Hormizd later escaped and fled to Constantinople where he lived in exile for the remainder of life. He was provided with a palace which much later became the residence of the emperor Justinian. Hormizd served against Persia in the army of the Emperor Julian (361–363). His son, another Hormizd, later served as a Roman proconsul. Meanwhile, in a perhaps unique coronation, the Persian throne was reserved for the unborn child of one of the wives of Hormizd II. The crown was placed upon the pregnant belly of the child’s mother. This child, named Shapur II, was therefore born king; his reign dated from 309 to 379, perhaps the longest of any Persian monarch. Until he came of age, the government was conducted by his mother and the magnates. Shapur II became one of the greatest of the Sassanid shahs. During the early years of his reign, a coalition of Arab tribes based in Bahrain, crossed the Persian Gulf and raided Fars. In retaliation he led an invasion of Bahrain, decisively defeated a coalition Arab army, and annexed the eastern coast of Arabia. Shapur became the greatest threat to Rome in many generations, engaging in two long-drawn out wars (337–350 and 358-363). Although winning a number of battles in the first war, Shapur was distracted by events to the east, an invasion of the Xionites, a mounted nomad people. This little known group people, known as the Xiong to the Chinese, appear to have been an early group of Huns, with a large admixture of Bactrian blood, and speaking Bactrian (a language closely related to Persian, instead of the Turkic language of later Huns). The Xionites, who fought as light mounted archers, are likely synonymous with the federation known later as the White Huns. After five years of campaigning, the Xionites were forced to make peace, and agreed to fight as mercenaries with the Persian army. The renewed war with Rome in 358 was considerably more successful. Although the emperor Julian won a major tactical victory at Ctesiphon in 363, he could not take the city. Shortly after, Julian was killed in a smaller follow-up skirmish. Leaderless and isolated, the Roman army was forced to come to terms. By the end of the war, Shapur had regained Armenia and all the territory lost to the Romans at Nisibis almost 70 years before. At the same time, Shapur had expanded eastward; re-incorporating what is now Afghanistan and Pakistan into the empire. 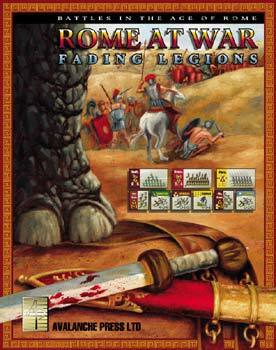 Re-fight the battles of Shapur and Julian in Rome at War: Fading Legions!